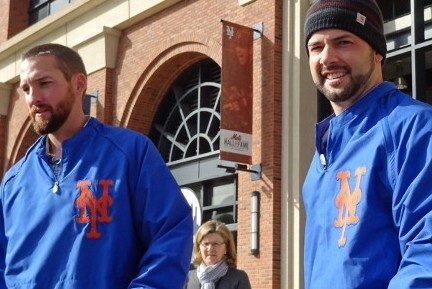 Mets right-handers Dillon Gee and Bobby Parnell participated in the food drive at Citi Field today. The Mets held the event in conjuction with City Harvest to help Queens residents affected by Hurricane Sandy. Parnell and Gee even had time to answer some questions about R.A. Dickey and the progress of Dillon’s arm.